Truform 1944 is part of the dress wear series for men. 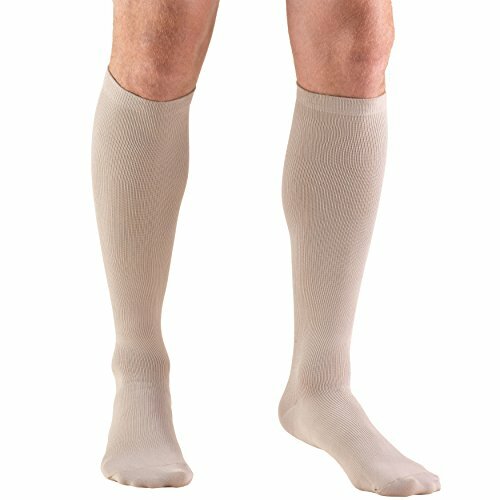 Designed to resemble a traditional dress sock with the added health benefits of compression technology, it features five intervals of therapeutic graduated compression which is greatest at the ankle, then gradually decreases up the leg. Graduated Compression Technology - Graduated compression provides two primary benefits to the legs: increased pressure on tissues beneath the skin helps reduce and prevent swelling, and the compression action helps control the size of superficial veins for increased blood flow. Firm 20-30 mmHg compression is doctor-recommended to help maintain good circulation and leg health. Stylish comfort - The designer rib-knit styling of specialty store socks is comfortable and easy to apply. Perfect for long plane rides or extended periods of sitting and standing. Use corresponding size chart. Package includes one pair.